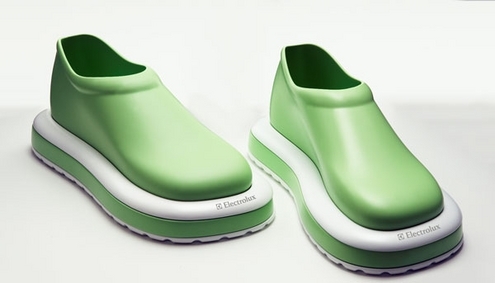 Electrolux Working On Vacuum Shoes | OhGizmo! By David Ponce on 01/23/07 • Leave a comment! Word is, Electrolux, maker of vacuums, is working on something which should have been invented, marketed and sold worldwide eons ago: vacuum shoes. These shoes feature special soles that stick to whatever dirt litters your grimy floor. You’d be free to then walk around your home, looking somewhat like a geeky platypus and cleaning your floor at the same time. Of course, that’s not to say your bare foot soles aren’t already doing this as we speak, but we imagine you’d really rather have some dried macaroni bits sticking to a specialized shoe rather than your own skin. Also, using the word vacuum in this context could be a bit of a stretch (doesn’t vacuum imply suction? ), but whatever. It would be pretty stupid if these shoes’ soles were not either washable or disposable, though we can’t be sure as details on this product are rather scant. We know it’s only a concept at the moment, though all the info we have on this comes from our big budget friends at T3. There’s no word on price, availability, or even if there is any intention to ever bring this to market. OhGizmo to Electrolux: get on it, pronto!